A memorandum of understanding signed by Holtec International and Energoatom envisages the adoption by Ukraine of Holtec's small modular reactor (SMR) technology with the country becoming a manufacturing hub for SMR-160 reactor components. Separately, the US Nuclear Regulatory Commission (NRC) has begun a technical review of an application by Holtec for a consolidated spent fuel interim storage facility proposed for southeastern New Mexico. Holtec's SMR subsidiary is working to commercialise the 160 MWe factory-built SMR, which uses low-enriched uranium fuel. The passively safe reactor's core and all nuclear steam supply system components would be located underground. The design has the flexibility to be used in remote locations, or in areas with limited water supplies or land, according to the company. 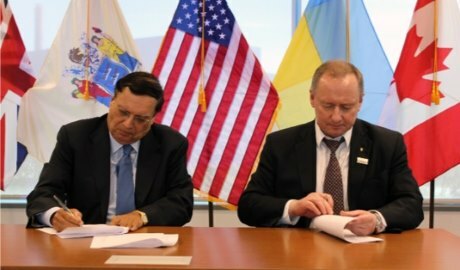 The memorandum signed in Camden, New Jersey, includes the licensing and construction of SMR-160 reactors in Ukraine, as well as the partial localisation of SMR-160 components. The Ukrainian manufacturing hub is to mirror the capabilities of Holtec's Advanced Manufacturing Plant in Camden, and will be one of four manufacturing plants Holtec plans to build at distributed sites around the world by the mid-2020s. The memorandum of understanding will be implemented through a joint coordinating committee. The NRC yesterday said it has formally docketed an application by Holtec to construct and operate a consolidated interim storage facility for used fuel from commercial nuclear power reactors in Lea County, New Mexico. The regulator has determined the application is sufficiently complete for detailed safety, security and environmental reviews to begin. Holtec is seeking to store up to 8680 tonnes of uranium in commercial used fuel using its Hi-Storm UMax storage system, for a 40-year licence term. Holtec also said it is in talks with "leading Ukrainian suppliers" of speciality machinery such as turbo-generators to integrate their products into SMR-160. Energoatom's president, Yury Nedashkovsky, is an active member of the Holtec Advisory Council. Holtec said he has told the Council that Energoatom intends to replace two VVER-440 reactors at the Rovno nuclear power plant with SMR-160s. Nedashkovsky cited SMR-160's "walk-away" safe design and Energoatom's "trust and confidence" in Holtec, based on the companies' long-term business relationship, as reasons behind Energoatom's selection of Holtec's reactor system. Holtec's 160 MWe factory-built SMR uses low-enriched uranium fuel. The factory-built reactor's core and all nuclear steam supply system components would be located underground, and the design incorporates a wealth of features including a passive cooling system that would be able to operate indefinitely after shutdown. No active components, such as pumps, are needed to run the reactor, which does not need any on-site or off-site power to shut down and to dissipate decay heat. The SMR-160 is planned for operation by 2026. The SMR-160 was selected by the US Department of Energy in 2012 as one of three SMR projects to be demonstrated potentially at its Savannah River site in South Carolina. The NRC is carrying out pre-application activities on the reactor design. Holtec International and GE Hitachi Nuclear Energy in February announced a collaboration to accelerate the commercialisation of SMR-160. Holtec has also applied for a pre-licensing vendor design review for SMR-160 by the Canadian Nuclear Safety Commision, and last year signed a teaming agreement with Canada's SNC-Lavalin to collaborate in the development of reactor. Under that agreement, SNC-Lavalin - the parent company of Candu Energy - will provide Holtec with a range of nuclear engineering services, including supporting the licensing of the SMR-160 reactor.